Pro-Ject's factory has clearly been busy this month - news has just reached us of a second new turntable under £500. 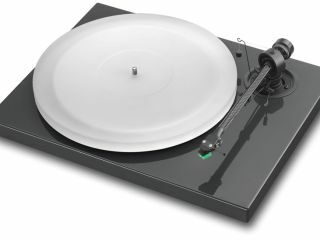 Only last week, Tech.co.uk brought you details of a new budget-busting £125 turntable from the company - the RPM1 Genie. Now the Litovel-based company has announced a new Xpression III, to join its entry-level Xpression series, which sits just above the budget Debut range. The new turntable comes complete with a proprietary Pro-Ject 8.6c tonearm, which features hardened stainless-steel points and sapphire thrust-pad bearings, together with a carbon fibre tube and fixed-aluminium head-shell. The company is also supplying an Ortofon 2M red cartridge with every unit. The turntable uses an acrylic platter mounted onto a stainless-steel shaft, sitting on a polished ball bearing for maximum stability. Xpression III's motor has been physically decoupled to keep unwanted vibration to a minimum. As with all Xpression turntables there are two speeds: 33rpm and 45rpm (with 78rpm as an optional choice). The unit will be available in a dark grey piano-lacquer finish, with a clear acrylic dust cover and is expected to sell for around £325.